Did December hit you unawares? It did me, which is funny for two reasons. For one, I have this little blog that I've been planning holiday crafts for. And secondly- and most funnily of all- my birthday is December 2nd. So if there's anyone who can usually smell December a week away, it's me. But I wasn't ready for December this year. And then when it came, I sank into a bout of the winter blues. As someone who loves keeping busy, I don't usually make time for the blues- but I haven't been able to shake these off. While I love Christmas, the busy year we've just had- selling houses, buying a house, moving an hour away, miscarriages, leaving our community- has just caught up with me. So I'm creating this list of ways to get into the season for myself, but I'm posting it because maybe someone you know- or maybe you too?- might be having a hard time reconciling the losses the year has held with the glitter of the season. Which is always hard, but especially so when we have little ones looking to us for the glitter and magic. Get to the heart of the tradition. I was all set for advent this year. 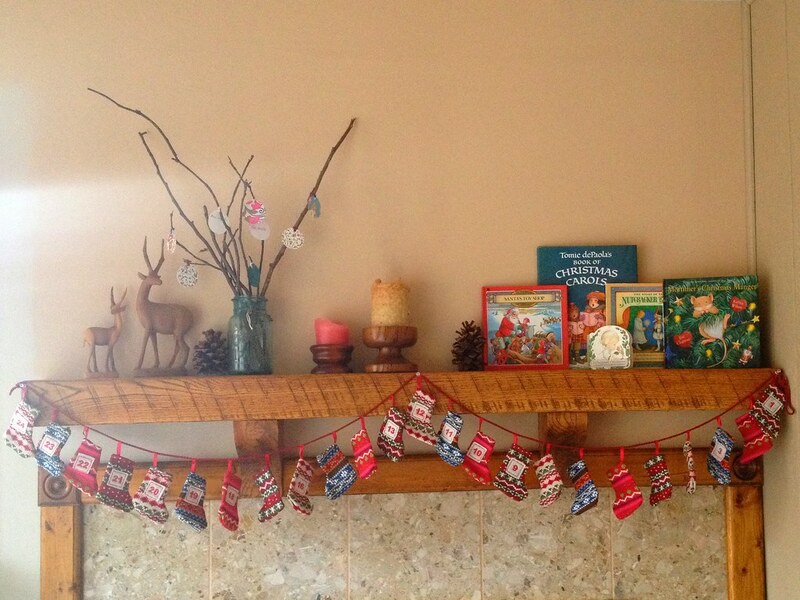 I had found the perfect advent garland, I had activity ideas... but then this slump hit and it all felt overwhelming. Why did I want do advent? I asked myself. My answers were focusing on the Nativity, celebrating our changing seasons & having special time together. So I decided to not plan out our activities, but to let them happen naturally. Beginning our day with a devotion, reading the holiday books on the mantle, and working on presents, little by little, have been our traditions right now. And while glitter is nice, it's easy to forget that the first Christmas didn't have any- just straw, manger, and a family. And that was more than enough. Don't sacrifice your joy, but take shortcuts on everything else. I'm guilty of wanting to make everything from scratch. But there's a time for shortcuts, and when you're feeling down is definitely one of them. So I splurged on sugar cookie mix, so we could focus on shaping & decorating the cookies (my favorite parts) instead of the whole process. I'm also realizing that trying to do everything perfectly robs me of spending more time on those few things that bring me real joy- like knitting and eating the cookies we decorated. Trade, Swap, and Ask for help! We have the beginnings of a community in the woods, but I miss my neighborhood community that we left behind dearly. When you're feeling down is the time to lean on the enthusiasm of others. If you're feeling down & want to make cookies, then offer to buy ingredients, help, and wash the dishes for that friend who bakes cookies for her whole neighborhood. Make extras of a present and swap with a friend for some of their homemade goods. Trade kid time with a neighbor to get a nap. You get the idea. Take care of yourself & cut yourself slack. Speaking of naps, getting more sleep has become a priority with feeling down. So I've been putting my projects down at night and heading to bed. I'm also drinking more water too. It's easy this time of year to get busy and neglect ourselves- especially when we feel sad- but it's important not too. Because what makes feeling sad worse? The flu! It's so easy to think that our kids needs the projects, the cute food, the Pinterest childhood. Being sad I started to feel guilty, that I wasn't doing enough. Then a friend reminded me, they don't need the trimmings- they need you. 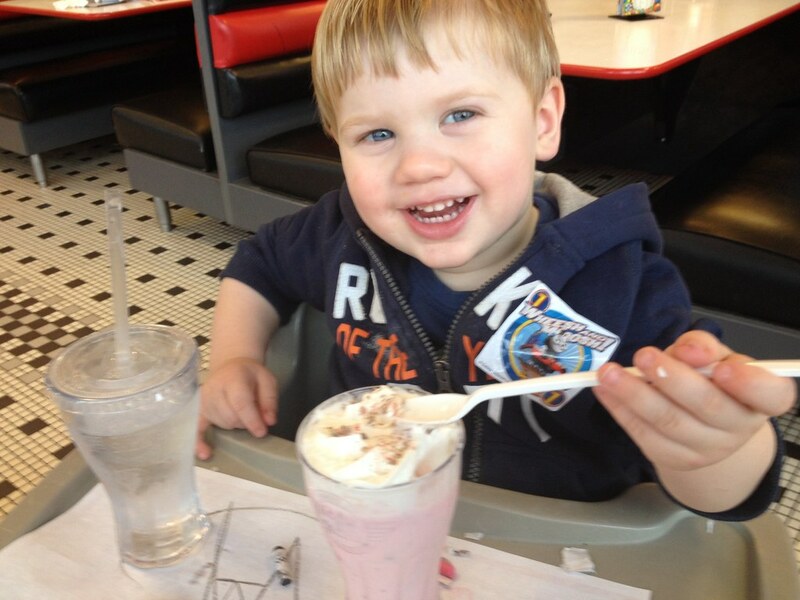 Of course, a peppermint milkshake never hurts either! Lastly, I want to thank all of my readers for coming to this space and making this blog a small part of your community. If this post struck a chord with you, feel free to connect with me via our Facebook page or by email (on the About page). We're all doing the best we can, and I think it's so important that we support each other in our efforts. The holiday is what we make of it, and I'm wishing a merry & bright one to you and yours. Happy Belated Birthday! My birthday is in December too (the 12th) - so I, like you, can smell December from a mile away. Great tips for shifting into holiday mode. I love your advent garland! So very cute. Happy birthday! Sagittarius is the most fun sign, by far ;) And thank you for your kind words too.